Azure AD is the cloud version of Active Directory and there are plenty of examples of how to make a .Net based webapp using it as its authentication source. However, since Azure AD supports OAuth and OpenID, there is nothing stopping an Open Source based website from doing the same. 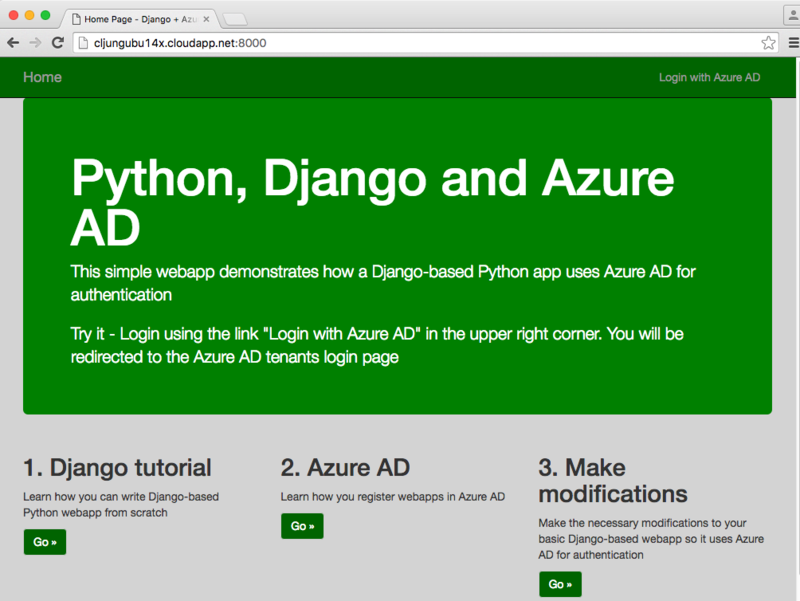 In this blog post I’ll show you how a Django-based Python website running on an Ubuntu Linux server (in Azure) uses Azure AD as its authentication source. To be honest with you, I’m not a Django expert. To make this example easy to replicate, I followed the “Writing your first Django app, part 1” tutorial on the official Django website (see refs). I’ve managed to get this sample to work on both Windows, Mac and Linux. Only deviation from the tutorial was that I called my app “site1” and not “polls”. Follow the tutorial all the way to making it responding with “Hello world”. You can run the code on your laptop, but you need to have an Azure subscription in order to everything I will do in this post. First of all, you need to decide which Azure AD tenant that will be the authentication source. If you are just trying this out, I suggest creating a new stand-alone AAD tenant. 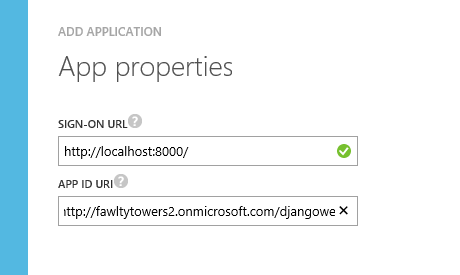 I created my lab AAD tenant called fawltytowers2 in my Azure subscription. 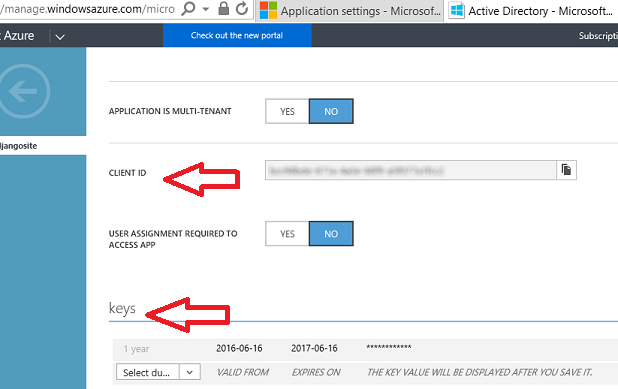 If you do the same, please remember that you become the Global Admin of the AAD tenant when you create it (see my earlier blog – The Holy trinity of Azure). When you have a AAD tenant, you create a new application and give it a name. The name is just internal to Azure and nothing you need in either config or expose publically. The Sign-on url need to match the url that the webapp is using, so if you run it locally it’s probably localhost and a port number, and if you deploy it to Azure, it is something like *.azurewebsites.net, *.cloudapp.net or similar. It can easily be changed, so don’t worry if you don’t get it right. The App ID uri is just an identifier in your directory and is most often the AAD tenant name with the app name appended. Finally, you need to create a key and copy that together withe Client ID, because this you will need to add to your Python config. All of the above is documented in many places and I included it here just for the sake of completness. 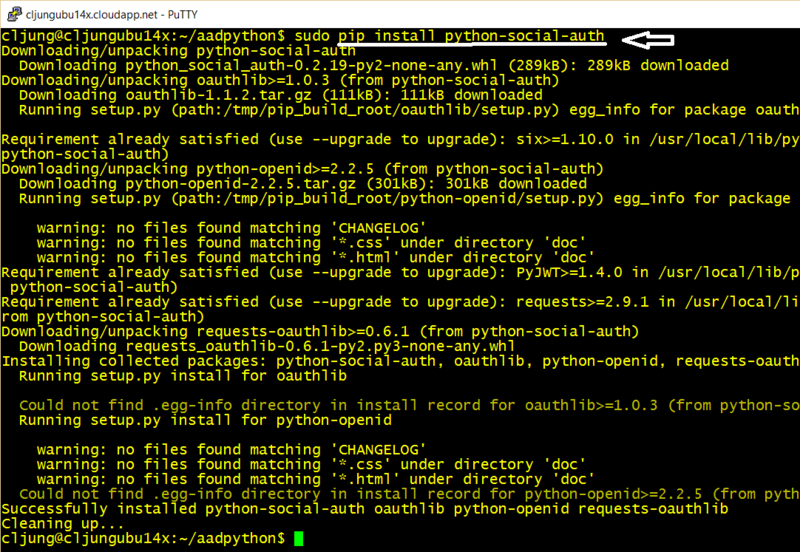 The first thing to do is to install the Python Social Auth implementation. This implementation exists on Github (see refs) and is a convenient way to add OAuth support to your Python website. Then the settings.py file needs to be updated in a few places. The INSTALLED_APPS must add the ref to social. All of the below needs to be added at end of the settings.py file, where the SOCIAL_AUTH settings are the Client ID and the Client Key you copied from the Azure Portal. The main urls.py file needs to be updated to include the following so that the url handling for the logon procedure is passed to the Python Social Auth code. I’ve added a simple HTML template named index.html which is the only page of the website. The logon/logoff code is handled in the loginpartial.html page. The social:begin part is the link that redirect the user to Azure AD for authentication. I deployed the Django-based Python website to an Ubuntu webserver hosted in a classic Azure VM. When running the page, it presents you with the option of authenticating via pressing the link “Login with Azure AD”. 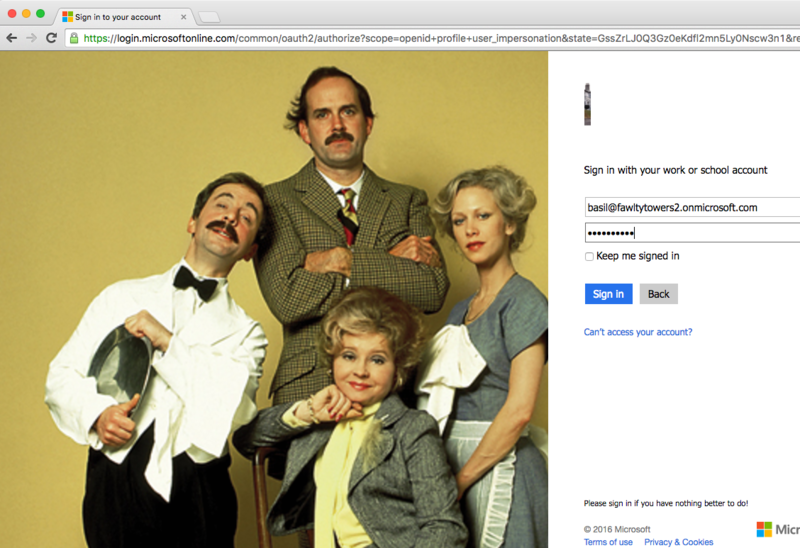 Clicking on the link directs you to Azure AD and in my case my fawltytowers2 AAD tenant (which I’ve decorated with a background image using the classic Azure portal). 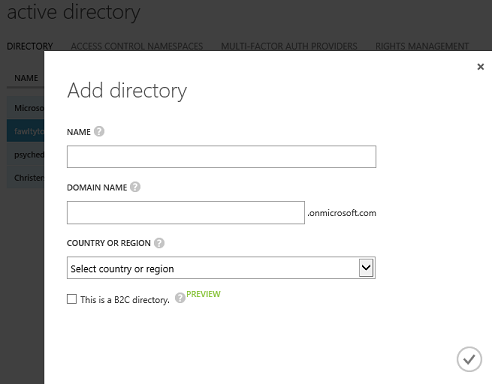 I present my user credentials to Azure AD which redirects me back to my website upon successful logon. The page see’s that the user is authenticated and adds some of the user’s claims in the page output. Azure is a Microsoft product but is far from Windows-only. Azure is a platform ready to host Open Source workloads and the adoption of it from the OSS community is happening rapidly as we speak. Active Directory is a center piece in many Enterprises’ infrastructure and with Azure AD in the public cloud, it reaches even futher beyond LDAP and Kerberos. Many examples and tutorial exists about how to make Azure AD the authenticating source for a .Net solution developed with Visual Studio, but Azure AD can in fact be of services to anything using OAuth and OpenID. The authentication configuration can include Multi-Factor Authentication or whatever the security policy requires. 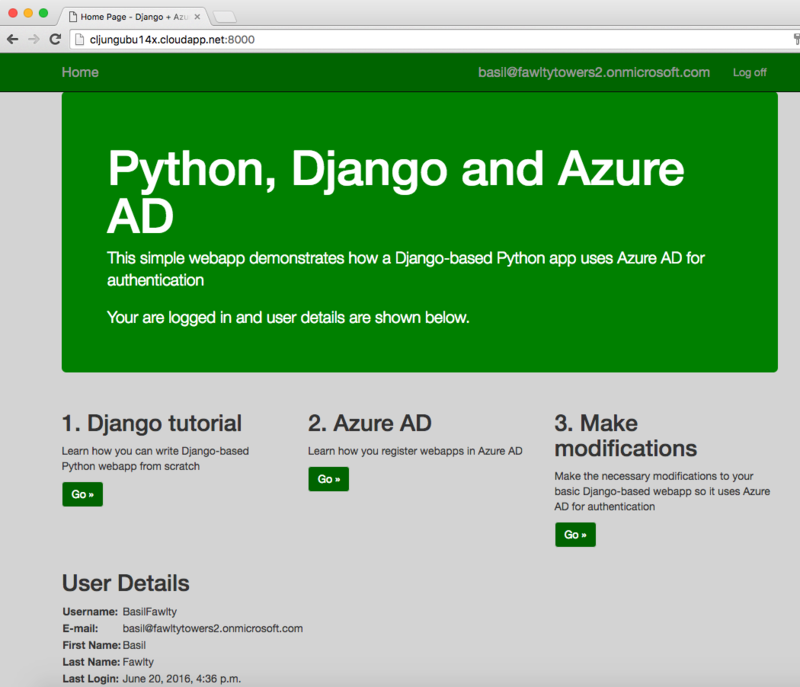 Adding Azure AD as the authentication source to Open Source webapps can be as easy as I showed in this example using this Django-based Python webapp.